Spoonflower is holding a doll panel contest. They got 77 entries including my design for 2 kokeshi style dolls. One is a blonde, the other is a brunette and a half yard makes up 2 10 inch dolls. A fat quarter makes the blonde doll. If you'd like to see my design and the other designs in the contest you can see them here.Whichever design wins will be put up for sale by Spoonflower. Because I really love that doll... 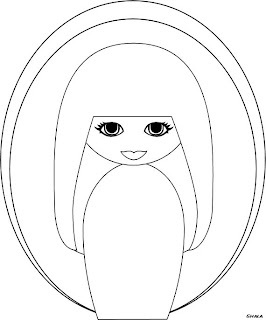 I did a coloring page that little girls can decorate.As usual, click on the design for the full sized version. In other news, yesterday I had a plan to make shortbread and read Oscar Wilde. Instead I spent way too many hours working on a digital scrapbooking kit. I don't even do digital scrapbooking.It's Halloween themed, and as soon as I can stand looking at it again, I'll zip it up and upload it for you all.